Sponsored content written & produced by Studio 61 of CBS Interactive's marketing unit in collaboration with the sponsor, Macquarie Telecom. Session Initiation Protocol (SIP) trunks is pretty much set to meet the standard of the future for voice communication and many more services. It&apos;s cost effective and provides more value for businesses than traditional landlines. While Integrated Services Digital Network (ISDN) is commonly used in businesses today -- it has become an old technology. First defined as far back as 1988, it became the standard for business communications. It had the ability to handle the simultaneous transmission of voice, video, data, and other network services over the standard public telephone network. And was fast, reliable, and at the time the most fully-featured communications platform available. ISDN was a popular technology for businesses as it allows users to attach multiple devices to a single connection line. In other words, rather than having to dedicate a line to each application of voice, video, and data -- a user could instead collect all of that technology into a single box and use that instead. Those older phone systems that many offices have, can do more than simply making calls in and, thanks to ISDN technology. When first introduced, ISDN also offered speeds that were quite incomparable to anything else at the time. At 64, or even 128 Kbytes/s for both uploading and downloading, this speed was more than fast enough to run a businesses’ entire communications platform when it was new technology. It could also access packet switched networks, with the quality of the phone calls higher, than what was previously possible over standard phone lines. However the technology was expensive by comparison to others at the time. The advantages of ISDN meant that it became the default platform for handling a large number of critical business applications. A company’s ISDN infrastructure would manage faxes, cash register EFTPOS machines, and entire computer systems; precisely because it was able to scale, and handle so many devices simultaneously. It was the technology that was required for the popular PABX systems, which were the default phone system for any business that had more than a couple of employees. ISDN is still in fairly common usage today; particularly in rural areas where more modern Internet services have been prohibitively expensive or unreliable, making a transition to modern, data-heavy communications platforms unviable. Two major telecommunications companies currently offer ISDN services; Optus (via MultiLine), and Telstra. Indeed, Telstra still generates hundreds of millions in revenue from ISDN services. But This Is Changing -- in late 2016 Telstra made the announcement that it will be no longer be provisioning new ISDN services, as of 2018. "Telstra has decided to exit Products across all geographic regions by 2022. Before this time, the underlying technologies and platforms that support these Products will have ceased being supported by the relevant vendors meaning Telstra will no longer be able to provision and maintain services to satisfactory levels," it stated. Although nbn co -- the organisation responsible for the rollout of the NBN -- arranged to allow ISDN services to continue under certain circumstances. Telstra nonetheless advised existing customers on ISDN that it&apos;ll be able to continue using its services until between 2019 and 2022. Telstra will then roll out a series of cut-off dates. Once a final discontinuation of services date is determined, existing customers will no longer be able to make use of ISDN services. Currently, Optus has not announced a similar discontinuation process for its ISDN services, but with the NBN affecting all of Australia&apos;s telecommunication infrastructure, Optus will be in a similar position to Telstra. 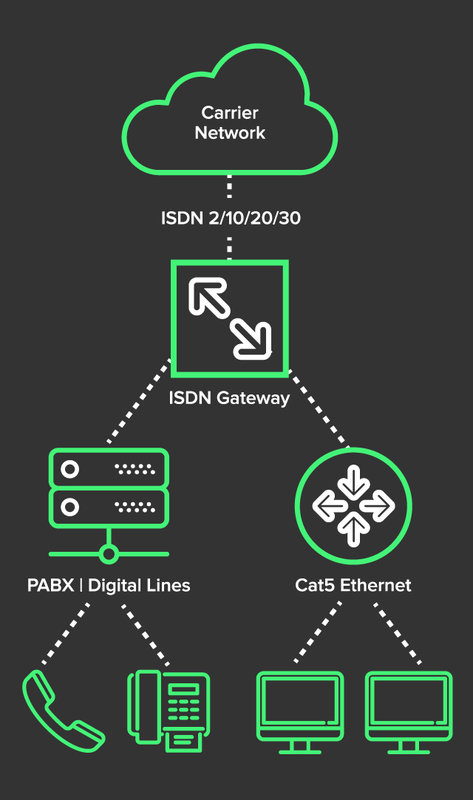 The process of making ISDN technology legacy is something that is being brought forward because the transition, from the technology can take anything from six to 18 months to complete. As ISDN services become legacy, customers will have an opportunity to shift their service providers to organisations such as Macquarie Telecom. The service provider can offer a more tailored communications platform using newer technology. 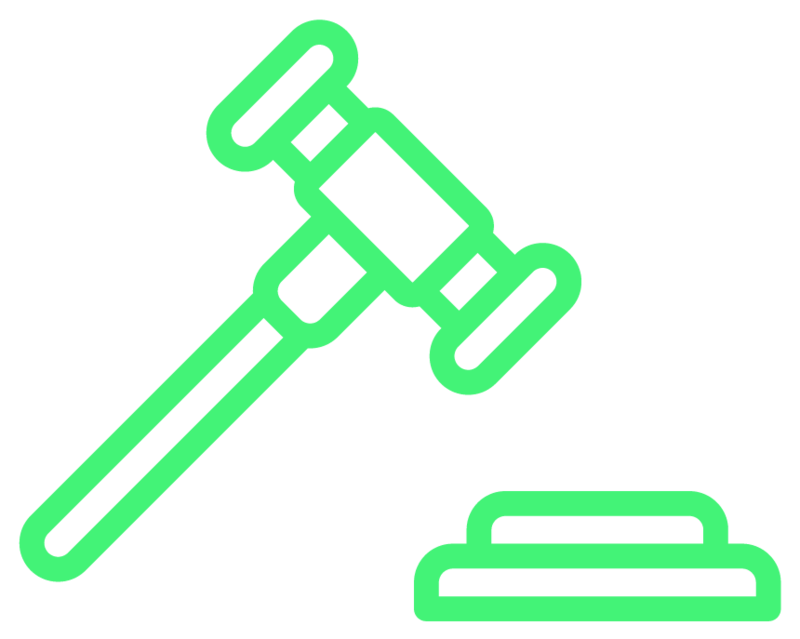 There is more choice and companies are encouraged to take the time, to make due diligence when selecting a replacement for their ISDN service. A business will need to develop a careful plan for change management, especially if it has critical systems like EFTPOS sitting on ISDN connections, and as such, the plan to make the transition needs to be articulated now. The great news for businesses is that, while they might be forced to move off ISDN services, the business will benefit from doing so anyway, as there have been such extensive improvements in communications technology that has meant that ISDN was antiquated long ago. The leading technology for communications platforms now is called SIP Trunking. After an organisation purchases the equipment needed to convert existing ISDN technology to SIP Trunking, the operation of the business becomes cheaper. 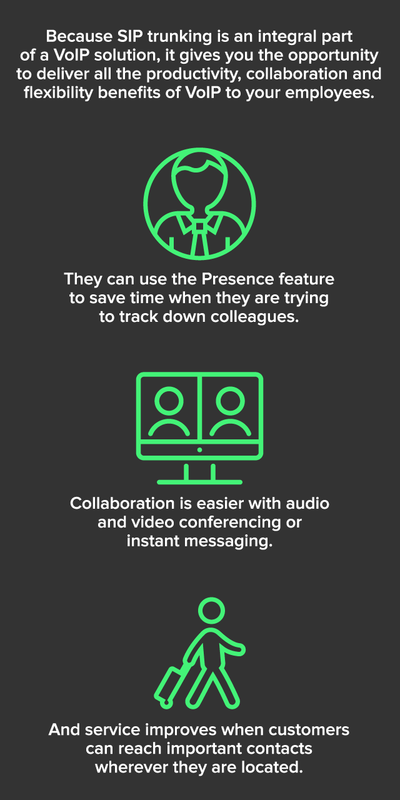 All long-distance calls become &apos;local&apos; calls, calls from within the organisation -- even to remote or branch offices -- become completely free. There&apos;s no longer a need to pay for separate voice and data lines into the business, cutting down on the cost per employee. ISDN services were also expensive when scaling, as you would need to upscale in blocks -- hire one employee above the existing limit with ISDN, and you&apos;ll need to buy enough new access in multiples of 23. With SIP Trunking you add (and reduce) costs based on the number of employees there are, cutting down on the cost of expanding. A reality of the modern workplace is that employees are increasingly mobile. They might work from home some days to maintain a work/life balance, or they might find themselves constantly on the road, meeting with clients and drumming up new business. SIP Trunking allows for the automatic re-routing of phone calls to the employee&apos;s mobile if they&apos;re away from the office for any reason. SIP Trunking allows for far more features to be run simultaneously. Voice calls, instant messaging, video conferencing, and recordable conference calls are just some of the features that a business gets access to when on a SIP Trunking system. As a result of this investment, businesses see a return on investment in under a year when transitioning to SIP Trunking, and enjoy numerous “soft” benefits in becoming a more efficient and productive, modern organisation. Transitioning from ISDN to SIP Trunking is a relatively simple, clean process, particularly when you partner with an organisation such as Macquarie Telecom. These service providers can offer the technical support to ensure the smooth transition, but it is nonetheless time consuming, and needs to be properly planned for to minimise disruption. Getting set up is straightforward, and involves a minimum change to existing technology. 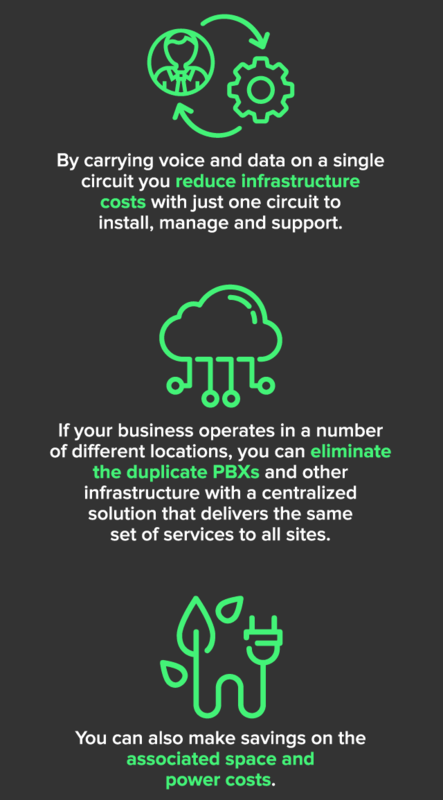 In most cases it&apos;s as simple as connecting a SIP Trunk to an existing IP PBX or PBX gateway. Although in some instances the technology might be too old, and require that you replace existing systems. In that event, there are hosted SIP-based systems available through Macquarie Telecom to help minimise the capital expenditure. Where things get more challenging is in considering the security for the system. As with all technology-driven assets within the business, you’ll need to make sure the SIP Trunking system is adequately secure with firewalls, system and user account passwords. Although security measures -- such as firewalls -- might need special configuration in order to securely allow good communication without letting malicious attacks through. It’s also important to engage with your telecommunications companies to develop a plan to port the phone numbers to the new system. In most cases it will be possible to do, but in rare circumstances it might not be, so you may need to develop a strategy to let clients know about the phone number change. Another reason that it&apos;s a good idea to conduct the migration process while ISDN is still active is that you can take advantage of redundancy. The ideal way to migrate is to have the old and new systems running side-by-side as you test and/or roll the system out in stages. One of the most effective ways to stagger the migration is to split it into two phases -- inbound, and outbound. Risk is minimised by focusing on one direction at a time, without compromising the overall health of the communications system by allowing existing system to continue to run in the background. Providers such as Macquarie Telecom have experts on hand that can assist businesses of all sizes in making the migration. The key is to kick the engagement with them off with plenty of time before the cut off to ensure that the migration can happen in a controlled, careful manner. For some businesses, the need to transition away from ISDN will be seen as an irritation. The technology still works on a fundamental level, and businesses have been successful when using the technology. The idea of a forced migration and a move to the NBN might seem like a waste of time and resources when the business is content with the way its EFTPOS and phone systems work. And yet, with the NBN, companies have a real opportunity to build a much more robust communications platform that will serve them into the long term, while adding extra functionality to help them run a more efficient and effective business. Many businesses that were still using ISDN were located in regional areas, where fast Internet speeds were limited. As the NBN rolls out to those regions, there will be no reason to maintain the ISDN connections any further. Even if the NBN hasn’t rolled in your area, it&apos;s still a good idea to start preparing the business for the transition now, in order to ensure that the move to SIP Trunking is seamless, and can start returning value back to the business immediately. SIP Trunking is set to meet the standards for the future for voice communications. It&apos;s not only cost effective, it also provides more value for businesses than traditional landlines. When an organisation makes the switch to SIP Trunking, they also upgrade their data networks, routers, phones and Internet connections in order to take full advantage of the many features offered by the technology. However one aspect that is generally overlooked or left out is disaster recovery or business continuity. Like it or not, technology fails. At some point, a SIP trunking services will be interrupted by a network failure, a hardware problem, or some sort of natural disaster. Many organisations are used to their landlines functioning even in the face of natural disasters and emergencies. And they tend to remain ignorant of the many dangers of not having a backup for voice communication in the event that something unexpected happens. However SIP Trunking was designed so that businesses can retain their telephone services, as well as unified communications, throughout a disaster. Setting up predetermined call protocols that route their calls in case of a failure to a predetermined number will help ensure that they will still be able to receive calls in case of an emergency. This solution is by far the simplest and probably the most inexpensive. In some cases, customers may wish to use one system, such as VoIP, for their main communications system but then set up another, like cloud or a legacy system for a backup system. This type of solution can get bulky and costly, but it may be an effective approach for some. Rethinking the network for digital transformationSponsored content written & produced by Studio 61 of CBS Interactive's marketing unit in collaboration with the sponsor, Riverbed.